Kids have always been curious about magnets. At a young age, they seem like magic, right? Well, toy companies have taken this wondrous element and created entire toy set out of it! As you can imagine, they have become a big hit among kids everywhere. 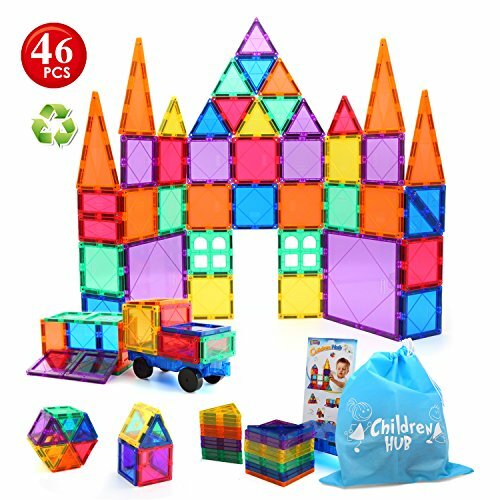 However, when you go to search for a magnetic building block set, you can easily feel overwhelmed by the wide variety of options that are available. That’s why we’ve extensively researched what some of the top magnetic building toy sets have to offer. As a result, all you need to do is have a read through our detailed guide below and pick out the one that suits your child best. There’s also a section at the end that’ll help you even further on choosing a magnetic set for your child! With a total of 109 pieces, you can be sure your child has plenty to play with. These pieces include triangles, diamonds, squares, trapezoids, hexagons, and pentagons. This is a great opportunity for kids to learn about shapes. A storage bag is included to make them all easy to clear up and take around with you. All of the pieces are made with toxin-free materials. They also have rounded corners to minimize the risk of injury. The parts also come in different colors. As a result, kids are able to develop their color recognition skills. Since there are so many parts available, they can build a wide range of structures. This is fantastic for their imaginative side. What age is this toy recommended for? What makes this toy stand out? The vast range of pieces in different shapes and colors are stimulating for kids and enable them to develop their recognition skills. Megaformers’ Space Episode set comes with a total of nine different shapes. As children are playing with them, they’re able to improve their shape differentiation abilities. We liked how they include a booklet to provide children with ideas. It inspires them to be more creative. This set can also be used with the other sets that are made by Megaformers too. All the materials used are also completely free from BPA and other harmful components. The space theme is something that kids have been loving. It encourages them to develop their storytelling abilities. 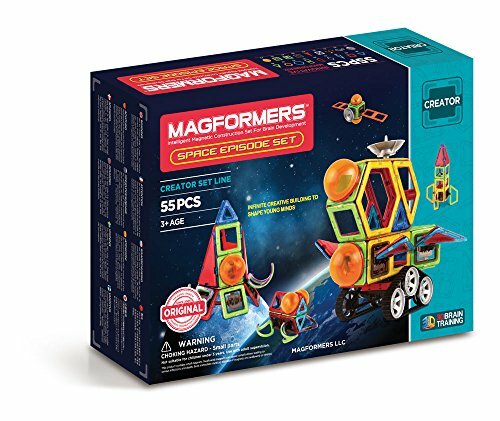 Kids have been loving this space-themed magnetic building set. It encourages them to play more imaginatively and work on their storytelling abilities. 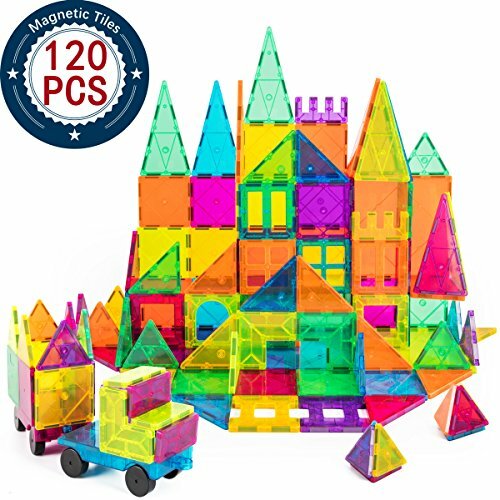 This magnetic building set comes with pieces that are designed in different shapes and colors. As a result, kids are able to develop their color recognition skills. With a range of pieces available, they are also encouraged to play more creatively and make different structures. 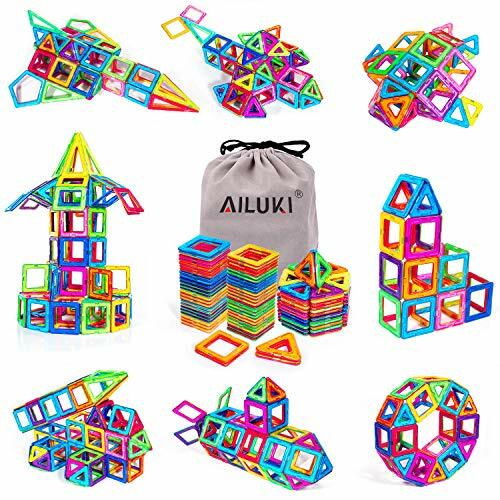 This set is also a fantastic way to introduce kids to 3D shapes and even architecture. We liked how you can use this set to let a child play independently, or with other people. This is excellent for helping them to create bonds and develop their independence. Parents have been liking how they can use this set to help their kids learn more about 3D shapes and structures. Dreambuilder’s magnetic tile blocks includes a total of 40 different pieces. These include squares and triangles. They are available in different colors too. Therefore, children are given the chance to work on their color and shape recognition skills. With 40 different pieces, kids can’t help but be encouraged to get creative and build all kinds of structures. We liked how all the pieces are made with high-quality and durable materials. You can be sure that they’ll last you for years. All the materials used are also safe for kids. We liked how children are able to play creatively with the 40 pieces while also developing their color and shape recognition skills. This Dreambuilder Magnetic Building Block set includes an impressive 120 pieces. These include squares, triangles, trapezoids, hexagons, as well as cards and wheels. These cards have numbers and letter on them which are awesome for helping kids learn more about mathematics and language. Al the pieces are available in various colors too. So, your child is able to develop their color differentiation skills. While building different structures with these pieces, the creative side of your child is let loose. This is fantastic for helping them to have fun while also learning. All the parts have been made with high-grade ABS materials which are durable and safe for kids. With 120 pieces in different shapes and colors, your child can explore their imaginative side with no constraints. This Magnetic colors, and shapes. Some of the patterns include planes and dogs. These are highly stimulating for kids as they can develop their recognition skills. The shapes and colors also enable them to achieve this. With a range of shapes, patterns, and colors, your child will feel inspired to be creative and make different structures. We liked how all the pieces have been made with toxin-free materials that are safe for kids. Parents have also appreciated how they provide a bonus bag. It makes it easier for you to store the pieces away or take them out with you. The different patterns are a design feature which kids have been loving. It helps them develop their recognition abilities and to be more creative. The Dreambuilder Toy Magnetic Tiles Set comes with a total of 96 pieces. These include squares, triangles, semi-circles, hexagons, rectangles, and wheels. This provides your child with plenty of pieces to play with. As a result, they feel more inspired to create imaginative structures. With a range of shapes and colors available, kids are also given the chance to work on their differentiation abilities. All the pieces have been created with high-grade ABS materials. Therefore, they are very safe for kids. Kids love playing with sets like this one that has a wide range of pieces including shapes and colors. It’s very stimulating and helps to boost their imaginative side. 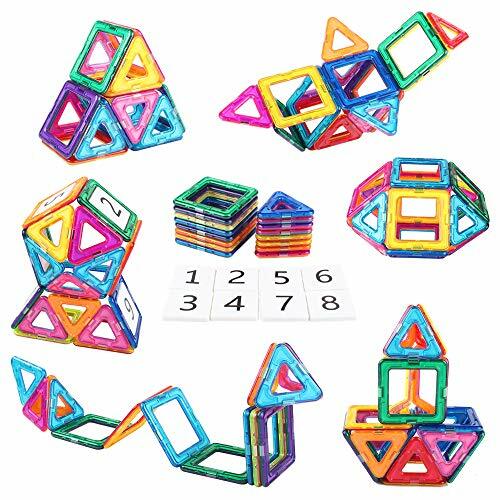 This Magnetic Building blocks set helps children to develop their creative and critical thinking skills. The different pieces mean that children are encouraged to build more complex structures. As a result, it may take more time and thinking to achieve it. They provide you with a booklet that’s full of different ideas. Your child can either follow the instructions or be inspired to create their own. When they create these structures, they’re able to learn more about 3D shapes and how magnets work early on. We liked how all the pieces included are durable and safe for kids to use too. Children can make all kinds of structures with the help of the booklet, or completely on their own. This ensures they can be creative and improve their critical thinking. 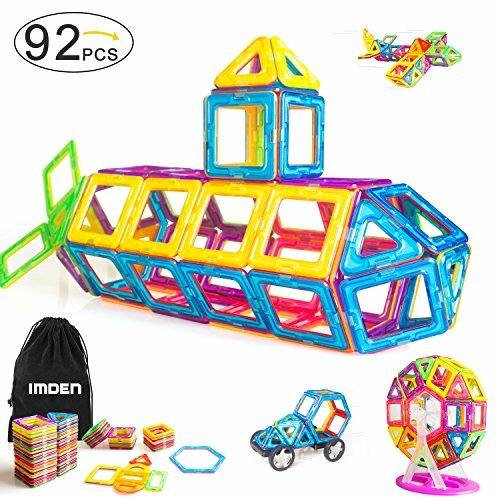 IMDEN’s Magnetic Blocks Set can be made into a range of constructions. These could include cars, planes and even dogs. We liked how you can combine this set with many other of the popular magnetic sets available too. It allows your child to mix and match between their different sets to be as creative as possible. Parents have been liking how easy this set is to clean up. There’s a storage bag available which can also be used to take the set with you while you’re on the go. You’re also given a peace of mind to know that your child is safe when playing with this set. This is because they’re made with high standard materials that exceed the safety regulations in the U.S. The fact that you can use these magnetic pieces in combination with others means that creative possibilities for kids are endless. These magnetic pieces are made with ABS plastics which are of a high-quality. All these pieces also have a rounded-edge design to keep them smooth. This makes them durable and very safe for kids. 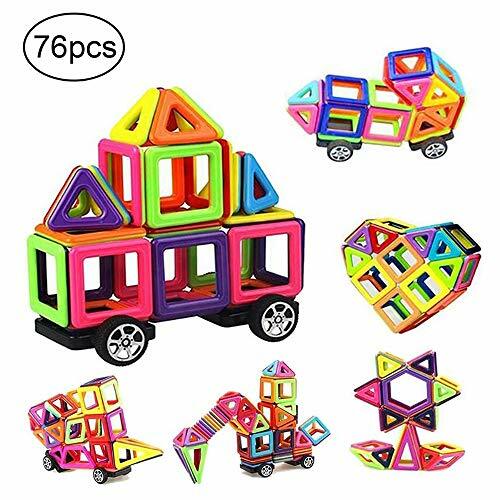 There are various shapes and colors available which is awesome for kids. They’re able to work on their shape and color recognition skills. They can also build different structures which his fantastic for developing their critical thinking and the ability to be creative. They can choose to make shapes in 2D or 3D. Therefore, it’s a great set for younger and slightly older kids. With a total of 110 pieces available, your child will have fun playing with this set for hours on end! There’s also an instruction booklet available to give them ideas. The fact that you can choose to make 2D or 3D structures means you can use this set for years. While your child is younger, the 2D shapes would be more suitable. But as they grow older, they can move onto the more challenging 3D structures. With a total of 74 pieces available, kids have plenty to play and build with. This set includes hexagons, squares, and triangles. This provides children with a fun way to learn about different shapes. There are is also a total of 26 cards that have the alphabet on them. These enable your child to strengthen their language knowledge. 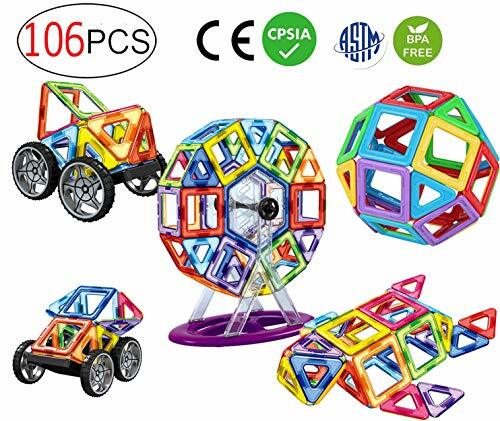 We liked how they provide you with eight parts for a Ferris wheel as well as two wheels. This ensures that kids are able to use their imagination to build different structures using these parts. To inspires kids even further, there’s a manual included. It contains a variety of structures and instructions for kids to build them. however, your child can use this as inspiration to go off and create their own structures. Parents have appreciated how easy the various parts are to clean. All you need is soap and water! Not to mention, the parts are made with high-quality materials that are safe for kids. We were impressed with the number of pieces, shapes, and alphabet cards they included. They all work to help your child learn in a fun way. 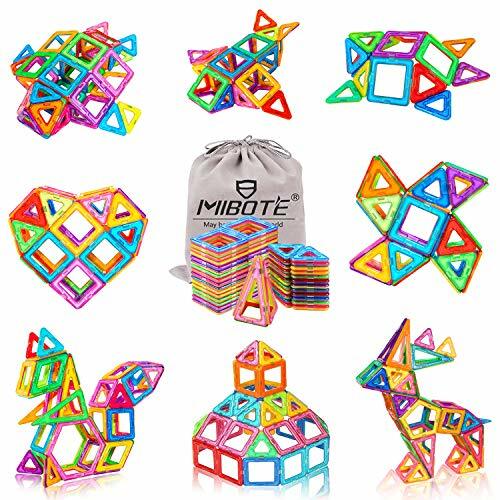 The Kids Magnet Building Toys Tiles set is fantastic at helping kids to learn about geometrical shapes, colors, as well as 3D structures. You could also use these magnet pieces as a chance to teach them about how opposites attract. These tiles are awesome at ensuring kids use their creative side to create a huge range of structures. With windows, triangles, squares, rectangles, arches, and car bases available, the possibilities are endless. By having so much to build, your child will be able to develop their problem-solving and motor skills. 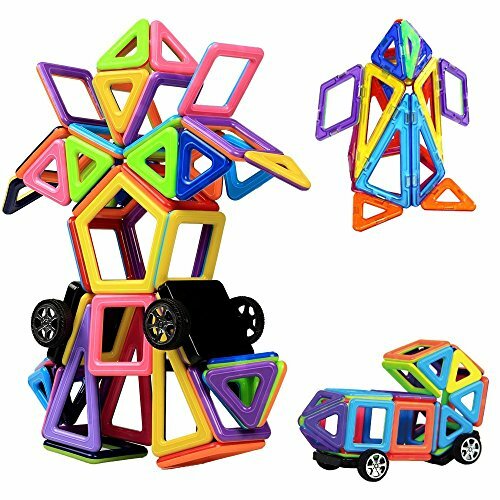 With a range of shapes available to build with, your child will be improving their problem-solving and motor skills, while also being highly imaginative. 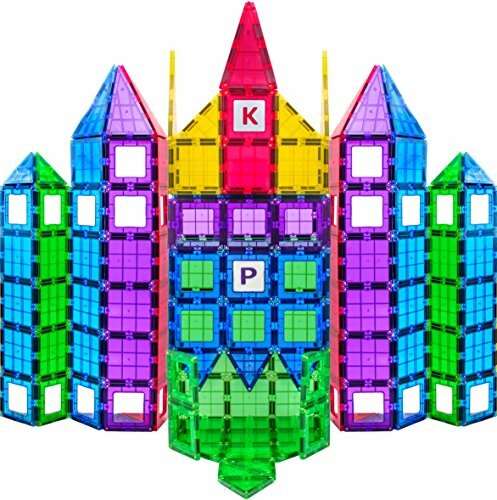 The Playmags Magent Building set comes with an impressive 100 pieces. 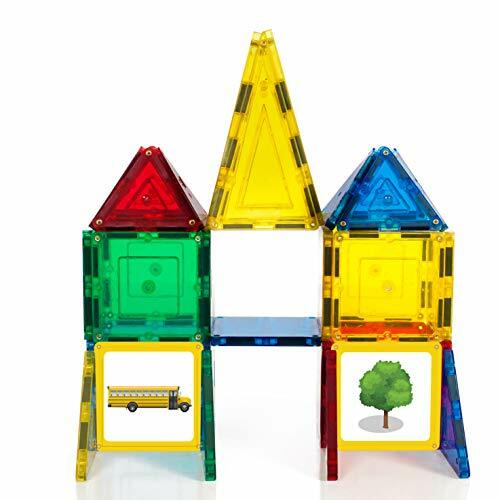 This ensures kids are able to play with tons of pieces to create all kinds of structures. This includes 3D structures, which you can use as a great learning opportunity to teach them about the differences between 2D and 3D. With such a wide range of pieces available, your child will be able to play creatively for hours. This is effective at stimulating their problem-solving and motor skills. It also strengthens their knowledge on the differences between shapes. 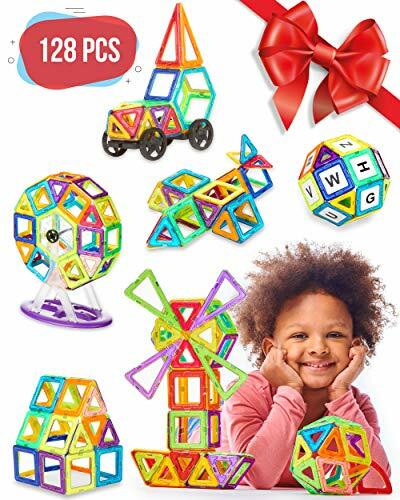 Since there are 100 pieces available in various shapes, kids are encouraged to learn about them while also being able to use their problem-solving skills to create more complex structures. 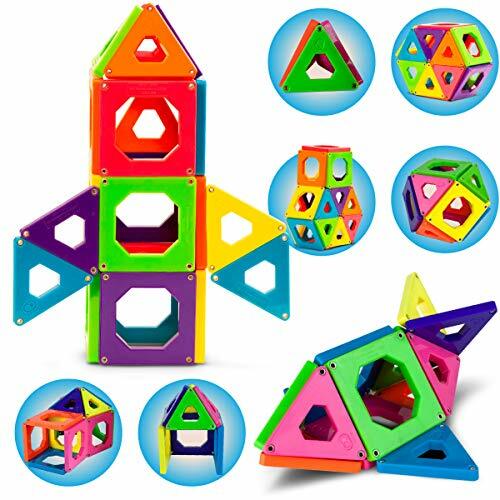 VACNNY’s Magnetic Blocks set includes a ton of bright colors and patterns. These are incredibly stimulating for kids and helps them to learn the differences between colors and patterns. As a result, their critical thinking skills are able to develop. We were impressed with how they provide you with 118 pieces. These include triangles, squares, trapezoids, diamonds, hexagons, semicircles, and rectangles. Therefore, your child can be engrossed in focused activity for hours which is great for their concentration. There are also 26 letter cards which help children to learn the alphabet early on. An instruction manual is available too. Kids can choose to follow the instructions or use it as inspiration to make their own structures. Parents have been liking how easy this set is to clean up as a result of the storage pouch. This also makes them very easy to take with you on your travels. 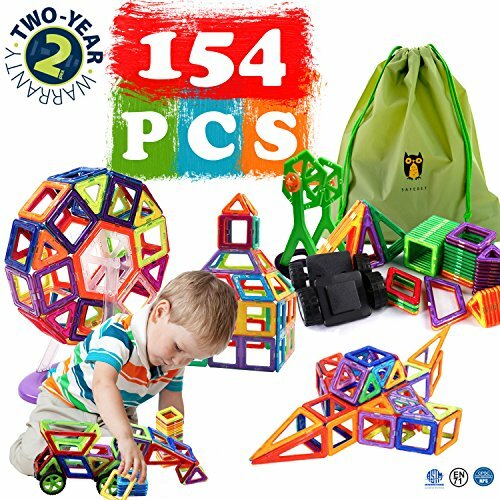 Kids are able to develop their problem-solving and motor skills, as well as improve their creative abilities with the 118 pieces available here. Ranohylx comes with triangles and squares. They are all available in different colors and are great for helping kids to learn more about different shapes and colors. There are also plenty of pieces available which helps them to play creatively. Since they can play with this toy set for so long, their motor skills are given the chance to develop better. All the materials used to construct the pieces with this set are free from toxins. So, you can feel confident in knowing that they’re safe for your child. We also liked how the ABS materials are of a high-quality. Therefore, they’ll last you for years. The size of all the pieces is also perfect for your little one’s hands. The size of the pieces available here is perfect for your child’s smaller hands. Therefore they’re able to explore different structures and improve their motor skills easier. Camande’s set comes with cards that have letters on them. We liked this feature as it enables children to learn about the alphabet and improve their spelling. These magnetic pieces have different colors on each side. This is awesome for helping kids to improve their color recognition skills. When children are building structures with this set, they’re able to be incredibly creative. This is also great for developing their critical thinking and cognitive function. All the of pieces included have been made with high-grade ABS plastics. These are durable and have been made with toxin-free components. The edges of all the shapes also have a rounded design. Therefore, your child will be completely safe while playing with this set. The different pieces and colors available with this set allow kids to develop their creative and critical thinking skills. Suncatchers has been made using bright colors. These are visually stimulating for kids and enable them to learn the differences between colors. We liked how they encourage children to build structures in 3D. These are more complex are require a higher level of focus and creativity. This is awesome for helping kids develop skills independently. We liked how all the pieces have been made with chemical and toxin-free materials. It ensures your child can play with this set for hours while being safe. We were also impressed by how the tile pieces have a scratch-resistance surface. 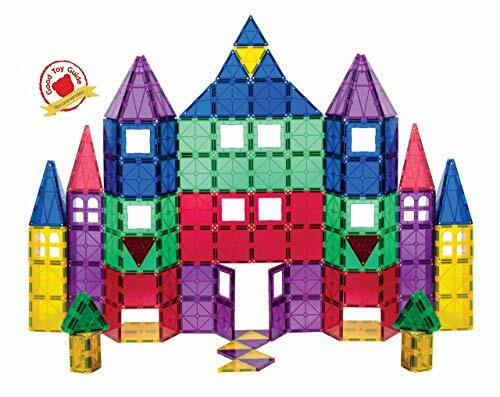 Children are able to build 3D structures with this set. This is more challenging which means they have to be more creative and apply more critical thinking skills. GLOUE’s set comes with an impressive 254 pieces! These include pentagons, trapezoids, hexagons, rhombuses, triangles, squares, semicircles, and more. With such an extensive range of shape available, kids are able to develop their differentiation skills. They’re also able to build a wider variety of structures. Therefore, their creative abilities are taken to the next level. They’ve included a booklet which contains ideas about what kids can create. They can either stick to the instructions or use them for ideas and create their own structures. Parents have been liking how easy this set is to clean. All it requires is some water and soap. Not to mention, clearing these pieces up and taking them away with you is easy too. This is a result of the storage box that’s provided. All materials used are also safe for your kids to play with. We were surprised to find a magnetic building block set that includes well over 200 different pieces. There are tons of shapes available which are awesome for shape recognition skills. It also gives kids the chance to be as creative as possible. 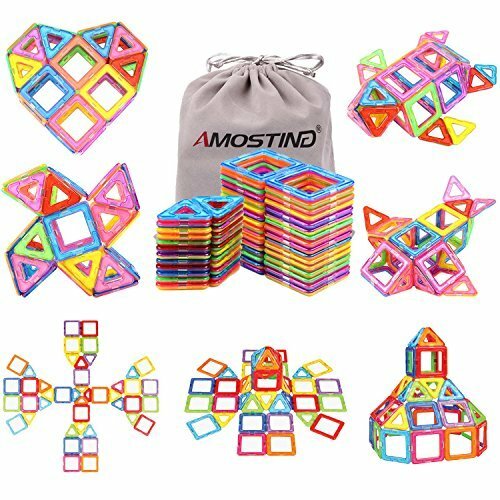 AMOSTING’s set comes with 24 pieces in total. These include quadrangles, triangles, and block pieces. Each of these pieces is available in various shapes and colors. As a result, your child can develop their shape and color recognition skills. With a range of shapes and pieces to play with, they are also given the chance to be super creative. As a result, they can create more complex structures. This is a fun and useful exercise which helps them to improve their problem-solving and motor skills. We liked how all the pieces have been created with rounded edges. They are also completely free from toxic materials. This gives you the assurance that your child can play with this set for hours while being safe. Furthermore, if you have other magnetic building sets, it’s likely that the pieces available with this one can be compatible with it. 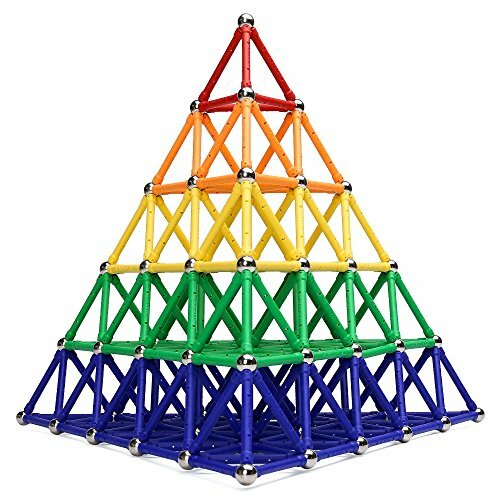 The various colors and shapes encourage kids to build more challenging structures. This is an awesome way for them to have fun while strengthening their problem-solving and motor skills. IMOO’s set includes parts that have been made with toxin-free materials. the corners of each piece also have a rounded design. So, you’re given the peace of mind to know your child can play with this set safely for hours. The various pieces available help children to work on their creative side. They’re encouraged to build a range of different structures which also develops their motor skills. You could also use this as a chance to start introducing your kids to the concept of magnets and how they work. Parents have been pleased to discover that this set is easy to clean. This means you can prevent germs from building up over time. There’s also a plastic box storage container to make storing the parts away easier. It can also be traveling with this set a breeze too. We liked how this set enables children to develop their motor skills. It also inspired them to create different structures and be highly creative. This Jasonwell set comes with tons of shapes and patterns. These include Ferris wheels, houses, animals, vehicles, and more. With 133 pieces available to play with, your child is able to let their imagination run wild for hours. This set has squares, triangles, circles, rectangles, and diamonds. This gives your child the chance to develop their shape recognition skills. All of the pieces have been made with ABS materials. These are free from toxins and safe for kids. To make the set even safer for children, all the pieces have a rounded edge design. This also makes them easier for little hands to deal with. Parents like how it comes with a storage bag as it allows you to put all the pieces away in one place. This also makes it easy to travel with the set. 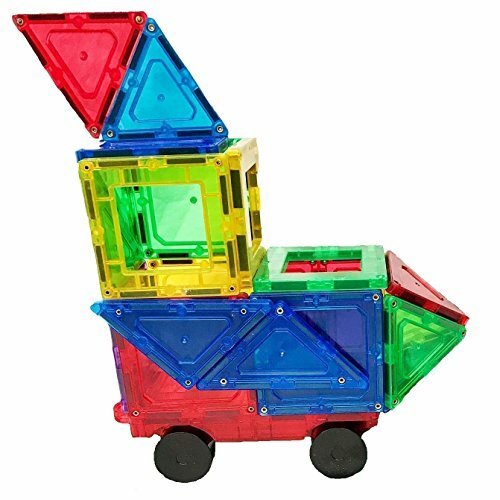 With such a wide range of shapes, patterns, and pieces available, your child can play for hours while developing their motor skills and color/shape recognition abilities. The PlayMaty set comes with an incredible 306 pieces. This provides children with an enormous range of pieces which enables them to get super creative. These pieces have also been designed with various colors and shapes. As a result, kids can work on their color and shape differentiation abilities. Children are also encouraged to create more complex structures. With over 300 pieces available, they can get as creative and wild as they want. This set has over 300 pieces which enable your child to get as creative as possible. The pieces are also in different colors, which helps them develop their recognition skills. The QAQADU includes 128 pieces which connect via built-in magnets. Each of the blocks is brightly colored which is stimulating for kids. It also helps them work on their color recognition skills. They provide you with a box that makes storage and cleans up a lot easier. Parents have been surprised to find how incredibly durable these pieces are too. You can be sure that it will last your child for years of creative play. Playing with these blocks allows kids to develop their problem-solving and motor skills early on. This set promotes creativity due to the 128 pieces available. It’s also great for helping younger kids develop their problem-solving and motor skills. The Stick N Stack Junior Set has eight stile mags and 32 tiles that are magnetic. 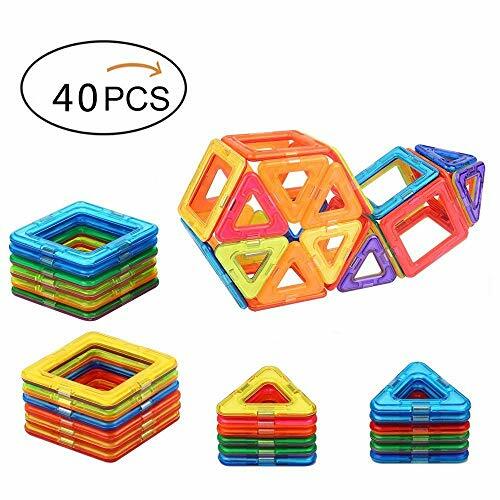 In total, there are 40 pieces available for your child to play with. As a result, they are left with plenty of pieces to create a wide range of different structures. This is fantastic for boosting their creative juices and problem-solving skills. Parents like how this toy set has passed the regulations in the U.S. for safety. It gives them the assurance they need to know that they’re kids are safe while playing with it. The 40 different pieces promote creativity and help kids create various constructions using their imagination and problem-solving abilities. LURICO’s Construction set is packed with 30 pieces. These include triangles and squares and are available in the colors of the rainbow. We were impressed with these features as they enable children to develop their color and shape recognition skills. It also teaches them the colors of the rainbow. With various shapes and colors, the imaginative side of your child’s mind will be stimulated. This encourages them to create a wide range of structures. All the materials used are ABS plastic which is of a high standard. Each piece also has a rounded-edge design which makes these magnetic blocks for kids very safe. The colors of the rainbow and different shapes are fantastic for stimulating the visual senses of your child. It encourages them to play more creatively too. 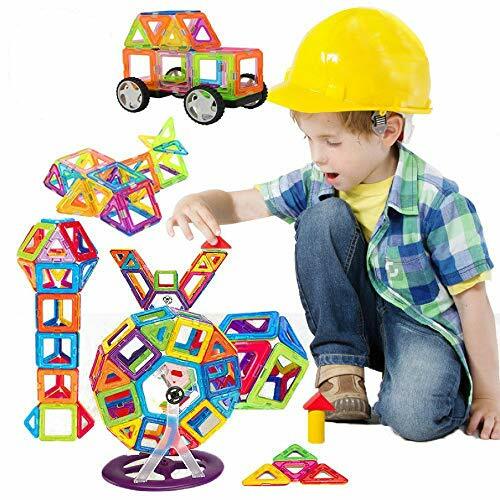 STEM’s Stacking Mangetix set is excellent for encouraging your child to play creatively. As a result, they’re able to develop their critical thinking skills. That’s because this set opens children up to a world where they can explore tons of different shapes and 3D designs. There’s a booklet included which children can follow to help them create awesome structures. However, they’re also free to simply use the booklet as inspiration to go off and create their own structures. We liked how all the pieces have passed the various regulations to ensure that they’re safe for your kids. 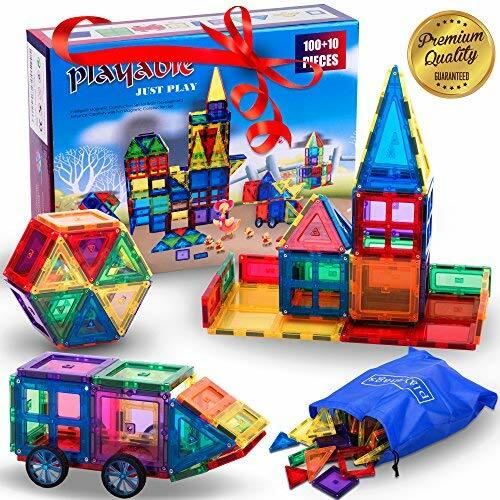 Kids are introduced to 3D structures and geometrical shapes when playing with this set. This is fantastic for developing their curiosity and critical thinking skills. 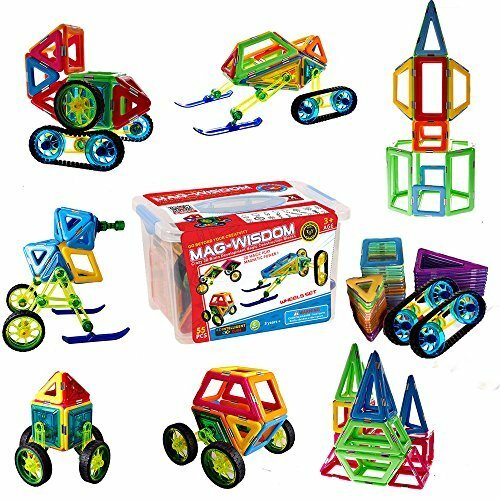 Jolly Mags Set is an awesome way for kids to play around with toys that connect and repel. You can use it as an opportunity to teach them the basics of how magnets work. As this set involves a lot of moving pieces around and fitting them together, your child’s motor skills are able to develop greatly. Furthermore, as they’re creating various structures, their problem-solving skills will be improved too. You can use this set to create either 2D or 3D structures. Therefore, it’s great for younger and slightly older kids. Younger children can stick to the 2D ones until they’re older and ready to delve into the more challenging 3D structures. We were also impressed with how the tiles can be blended in with light to show teach children about reflections and how colors can mix. We liked how this toy set has a heavy educational value to it. It teaches children about 2D and 3D structures. It also offers learning curves on reflection and how various colors can be combined. 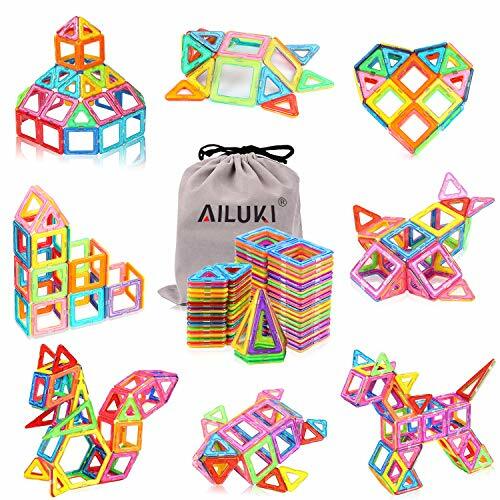 The AILUKI’s sets have been made with a variety of bright colors. These are fantastic at stimulating your child’s visual senses. As a result, they’re also able to learn more about differentiating colors. This set also included numerous shapes. Kids are able to hold and observe them which is a very hands-on approach to developing their shape recognition abilities. Children have the opportunity to create either 3D or 2D shapes with this set. This is fantastic for helping them to explore the different kinds of structures available. Younger kids could focus on the 2D shapes until they’re more developed and able to move onto the more complex 3D structures. Parents are also given a peace of mind as all the pieces are made with toxin-free materials. Not to mention, each shape also has a smooth-edge design which makes them safe for kids. We liked how kids are open to both 2D and 3D shapes. It helps them to push the envelope on their understanding of shapes. The Discovery Kids Tiles Set is an awesome choice to help kids improve their motor skills. As they’re putting the various pieces together, they are also able to tell the difference between the various shapes and colors that are available. Once they begin to create more complex structures, their problem-solving skills will be activated too. 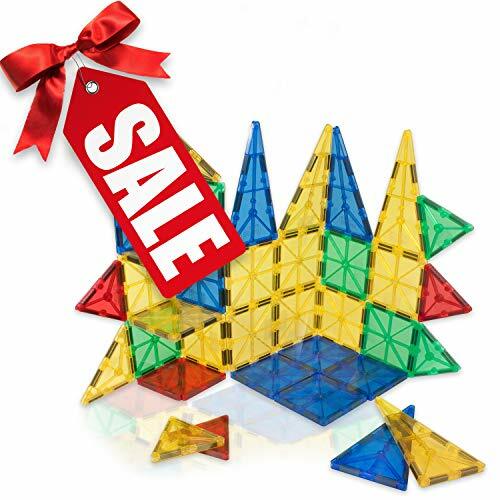 With triangles and squares available, your child is able to create some great 3D structures. As a result, their creative side is able to be explored and run rampant. These tiles can also be combined with a light source to show kids how reflections and color mixing works. This is a fantastic educational feature which kids find super interesting. We were impressed by how educational and fun this set is. Kids can learn about different colors and shapes, while also developing an understanding of reflections. Their problem-solving and motor skills are also given the chance to improve. This MAGEES set helps kids to develop their creative side. There are magnetic tiles which have clear-colored designs. These are great for kids to develop their color recognition skills. There are also 10 cards which have letters printed on them. These are effective at helping kids learn the alphabet and improve their spelling. To make the learning fun, you can slide these cards into the window slots on the tile pieces of the structure. Parents also liked how the materials used are free from BPA’s and toxins. It gives you the reassurance that your kids will be safe while playing with this set for hours on end. With the letter cards and ability to slot them into the magnetic tile window pieces, kids can learn the alphabet and improve their spelling while also having tons of fun. 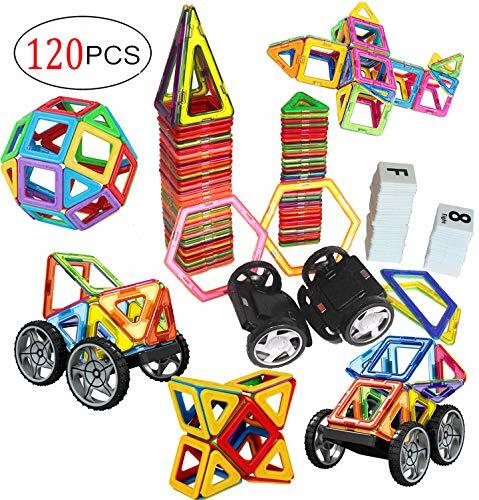 This Magnetic Toy Set comes with a total of 154 pieces. 102 of these pieces are magnetic blocks, but it also comes with 16 cards with numbers, as well as 26 cards with letters. So, kids are provided with plenty of pieces to get creative and make structures with. They’re also able to develop their language and spelling skills by becoming more familiar with the letter cards. The number cards are fantastic for teaching them the basics about maths. An instruction guide is included which kids can use to help them. However, they can choose to use it as a guideline to create their own structures instead. All materials used are made with ABS materials and each piece has a rounded-edge design. Therefore, you can be sure this set is safe for your kids. With the number and letter cards, children are able to learn about the alphabet and maths in a fun way. 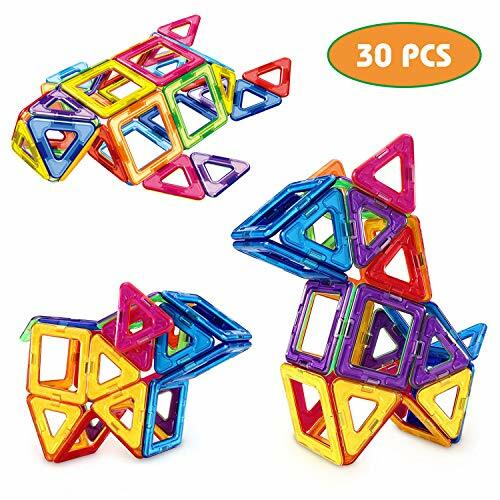 The 102 magnetic pieces enable them to get creative while making all kinds of structures too. Camkey’s blocks have a fantastic colorful design. They’re incredibly stimulating for your child’s visual senses. We also found them useful in helping kids develop their color recognition skills. All the pieces are made with toxin-free materials and have a rounded-edge design. As a result, they’re very safe for your kids to play with. The various building block shapes are excellent at improving your child’s shape differentiation abilities. Furthermore, as they’re creating structures, their hand-eye coordination skills are improved too. There are 40 pieces in total, which is enough for kids to get creative with the structures they build. 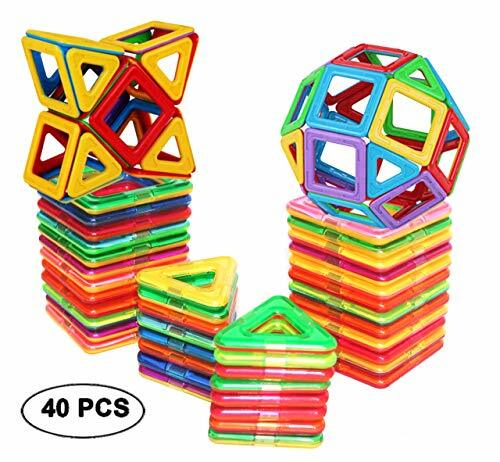 We also liked how it can be used along with other popular magnetic toy sets. Parents are liking how much their kids are able to learn about different colors and shapes. Not to mention, your child’s hand-eye coordination skills can be improved too. This VCANNY set is a fantastic way for kids to learn about different shapes and colors. You can also use them to teach your children about how magnets work. We liked how it can be used with other magnetic block sets. Therefore, it can fit right into your child’s pre-existing collection. All the materials used to create these pieces are free from toxins. They also have a rounded edge design which makes them perfectly safe for kids. These pieces have a clear colored design which is visually stimulating for kids. It also enables them to create 3D structures and get super creative. 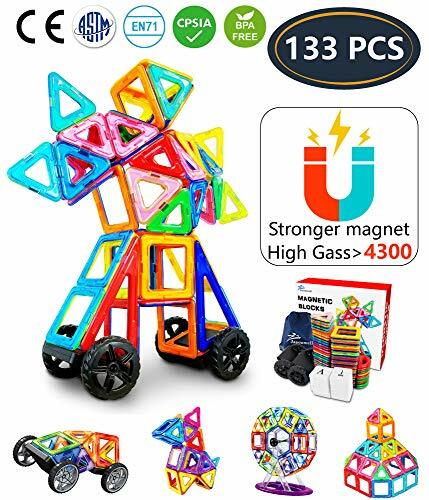 This is a fantastic set to teach kids about different colors and shapes, as well as how magnets work. The WITKA’s Toy comes with an impressive 200 pieces. 128 of these pieces are magnetic, while 72 of them aren’t. This means kids can experiment with how the magnetic and non-magnetic pieces fit together differently. With such a wide range of pieces available, your child will also feel inspired to create different kinds of structures. This is awesome for stimulating their creative side and problem-solving skills. The pieces are also available in different colors. This is useful for helping your child develop their color recognition skills. The mix of magnetic and non-magnetic pieces sparks curiosity among children. You can use it as a chance to teach them what makes them different and how magnets work. InooTech’s Blocks is a highly educational set. We liked how there are 72 pieces available because it enables your child to create a range of structures and become very imaginative. There are also different shapes in this set. They include triangles and squares. This is awesome for ensuring your child can improve their shape recognition skills. Users have been glad to discover that they also provide you with a storage bag too. This makes clean-up easier and it also means you can take this set with you on the go without any hassle. Children are able to make all kinds of structures and get creative, while also developing their shape and color recognition abilities. The Children Hub’s Tiles Set provides your child with the ability to be super creative. There are 46 pieces available for them to play with. They can use these pieces to create a wide range of different structures. The more the play with it, the better they’ll become at making advanced structures. As a result, their problem-solving and motor skills will improve. These pieces have also been made with various shapes and bright colors. Therefore, your child can also develop their shape and color recognition abilities. Parents are given a peace of mind in knowing these pieces are safe for their kids. This is because they are free from toxins. 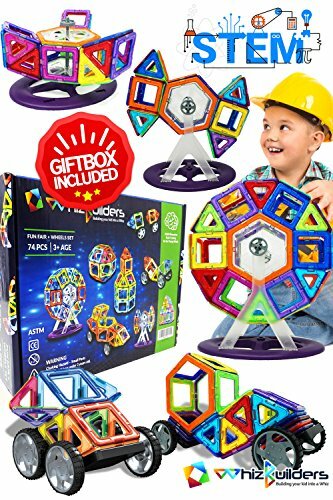 This is an excellent magnetic toy set that encourages kids to get creative and build structures. They’re also able to develop their problem-solving and motor skills. STEM’s toy set comes with a total of 60 pieces. These include triangles, squares, and rectangles. So, your child is provided with plenty of pieces to create all kinds of structures. Therefore, their creative side is left to run wild. The various shapes available are fantastic for helping them to learn how to recognize shapes too. They provide you with a manual that contains different ideas and instructions. Kids can use this as they’re starting out to aid them. However, they can begin to create their own structures after some time too. Parents appreciated how the pieces available are super easy to wash and maintain. All you need is soap and water! 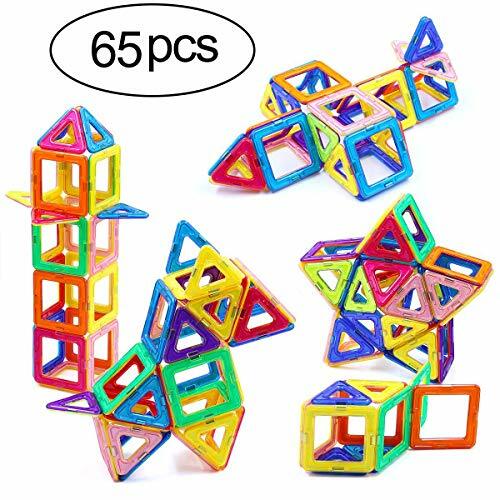 With 60 pieces and different shapes, kids can build creatively and develop their shape differentiation skills. 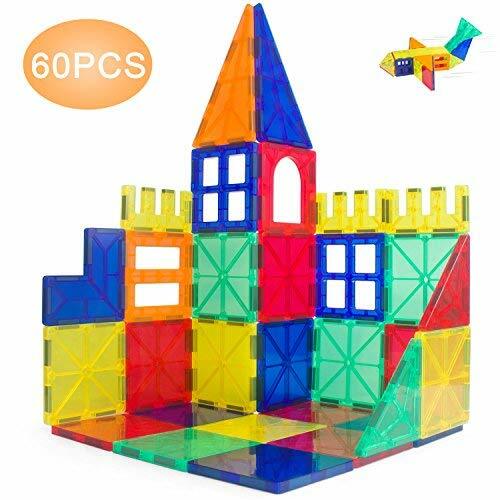 This magnetic building block set includes pieces that have 10 different shapes and 6 colors. These are very stimulating for a child’s sensory skills. It enables them to learn more about recognizing different colors and shapes. These pieces can also be sued to create 3D structures. They are a little more complex and your child will be required to conjure up more imagination and problem-solving skills. We were impressed by how well the magnets stay in place with each other. This is a result of screws that have been reinforced into the pieces. This keeps them durable so that they last your child for years. The round-corner design is fantastic for ensuring that your children are able to remain safe at all times too. 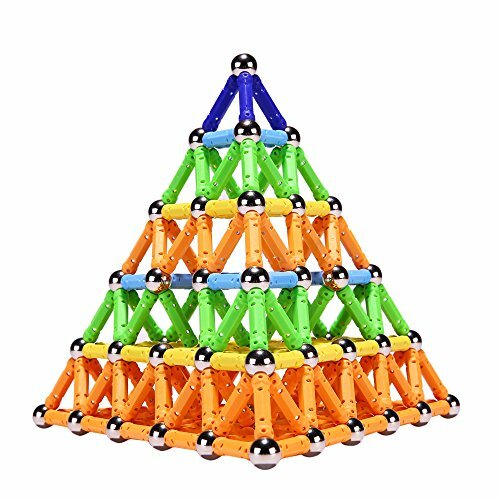 This set is incredibly durable, and kids can build complex 3D structures, without worrying about them collapsing! The Discovery Kids Building Tiles Set is awesome for helping kids learn more about magnets and gravity. With different shapes and colors available, your child is also able to develop their color and shape recognition skills. 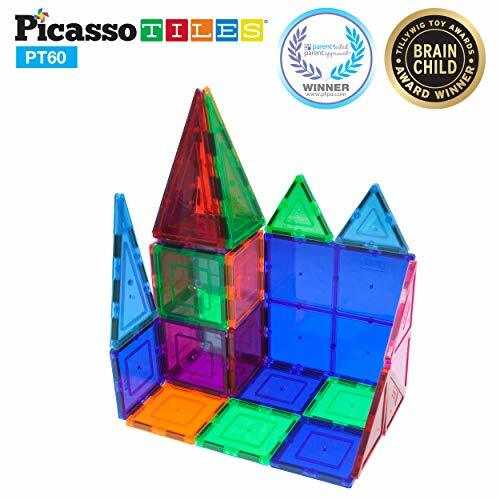 There are 25 squares and triangles which enables children to create wonderful 3D structures. We also liked how kids can use this set to create things with friends and family. It’s a great time to bond with each other! The colored tile pieces can be combined with a light source to teach kids about reflection too. This provides them with educational benefits that feel fun to learn. We were impressed by how you can teach your child about reflections, different shapes, and colors with this set. Their creativity is also able to run rampant by building 3D structures. 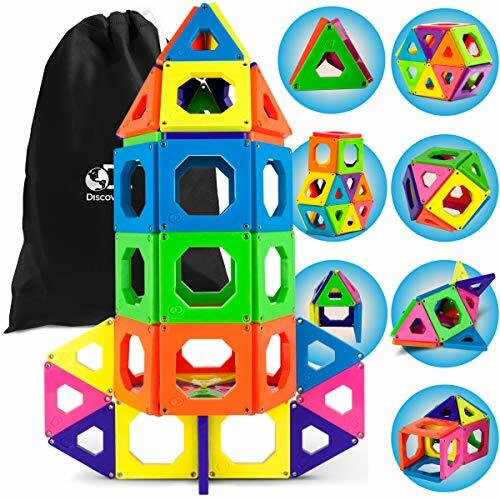 When it comes to picking the best magnetic building toys for your child, there are numerous factors to consider beforehand. To make that process easy, all you need to do is have a quick read through the section below. Kids who are anywhere between 0 and 2 years will require more supervision while playing with these toys. While they are created for the safety of your child, it’s a good idea to always keep a close eye on them to avoid choking issues. You will also need to be more involved in helping them build structures. Children who are 3 years and over still require supervision, but you can let them play a little more independently, and that can actually be helpful for their development. They’re at the stage where they’re able to pick up on how to connect the pieces and learn more. Once kids hit the ages of around 6-8, they’ll be able to play with the more complex magnetic building blocks mentioned in our review. You should encourage them to build larger and more complicated structures to add more of a challenge and help them develop. 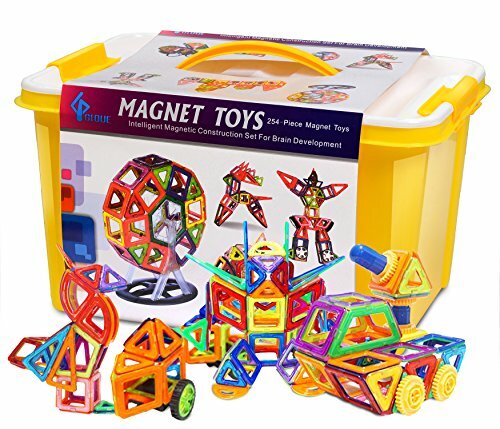 These magnet toy sets possess tons of learning benefits. For one, you can begin teaching your child about how magnets work from an early age. Many of the sets in our review also come with different shapes and colors. This is a great opportunity for kids to develop their shape and color recognition skills. Since these toys involve a lot of building and putting things together, your child’s motor skills will also be able to develop incredibly well. Once they’re able to start creating the larger structures, their problem-solving skills will have a chance to flourish too. Despite the fact that the toys in our review are deemed safe for kids, you should always be cautious. Be sure to check the recommended age range that we’ve provided for each item. This will give you a clear indication as to whether or not it’s suitable for your child. Before letting your child play with the magnet toys, it may be a good idea to check if they are all securely placed inside. If there are any loose pieces, they could come out and your child may ingest them which could cause damage. 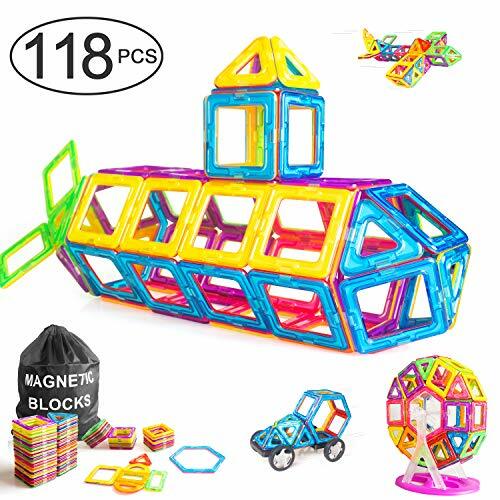 The magnetic building blocks and toy sets mentioned in our guide above are fantastic for kids. They help them to become extremely creative and develop their problem-solving and motor skills. We’ve included various sets that are best for a range of different ages. Therefore, you can feel confident about finding the one that suits your child best. Use our review and buying tips to help you find the set that your child can play with for years to come.